Last month, we travelled to Paris for SPINEXPO’s 3rd Autumn/Winter showcase, once again at the city’s striking creative hub on the Seine river, the Cite de la Mode et du Design. 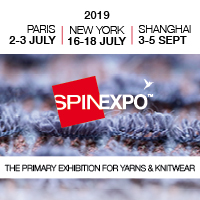 SPINEXPO founder Karine Van Tassel, curated 65 mill and manufacturer exhibitors, two thirds of which were yarn spinners, mainly from the Far East. For Autumn/Winter 2019/20, throughout both the yarn collections and Karine’s astute trend directions, there was a powerful underlying concept of transience, of a lifestyle that does not stop moving – physically, mentally, geographically.